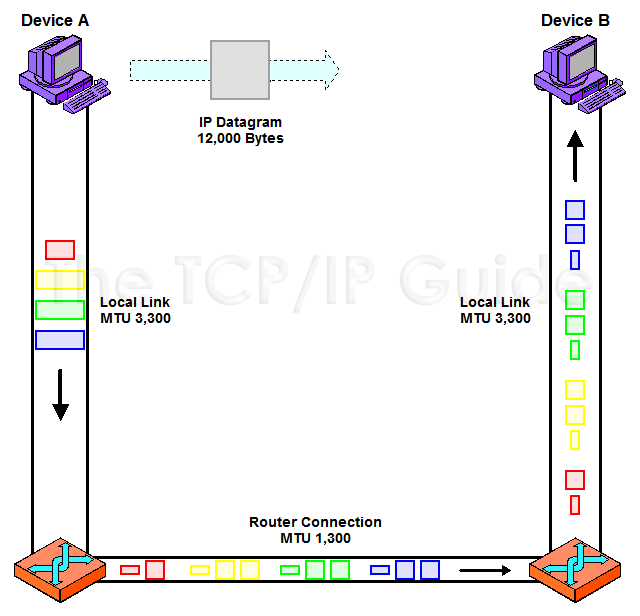 While the fragments above are in transit, they may need to pass over a hop between two routers where the physical network's MTU is only 1,300 bytes. In this case, each of the fragments will again need to be fragmented. The 3,300 byte fragments will end up in three pieces each (two of about 1,300 bytes and one of around 700 bytes) and the final 2,100-byte fragment will become a 1300-byte and 800-byte fragment. So instead of having four fragments, we will end up with eleven (3*3+1*2)! This is illustrated in Figure 89.